It’s not a mystery who the leader of the Raptors is. Kawhi Leonard was brought in to be the superstar that Toronto needs to make it to the next level. The Buddy Cop movie of Kyle Lowry and DeMar DeRozan was sweet. But for a city hungry to make it to the Conference Finals (at the very least), they needed Leonard and his cold-hearted, stoic game. So far this season, when Leonard has played, he’s delivered. He’s able to carry the load for Toronto for most of the game. When needed, Leonard can also create a shot for himself during key moments of the game. That was on full display when Toronto flew down to Washington to battle the Wizards. Leonard scored the bulk of his 41 points throughout the game. 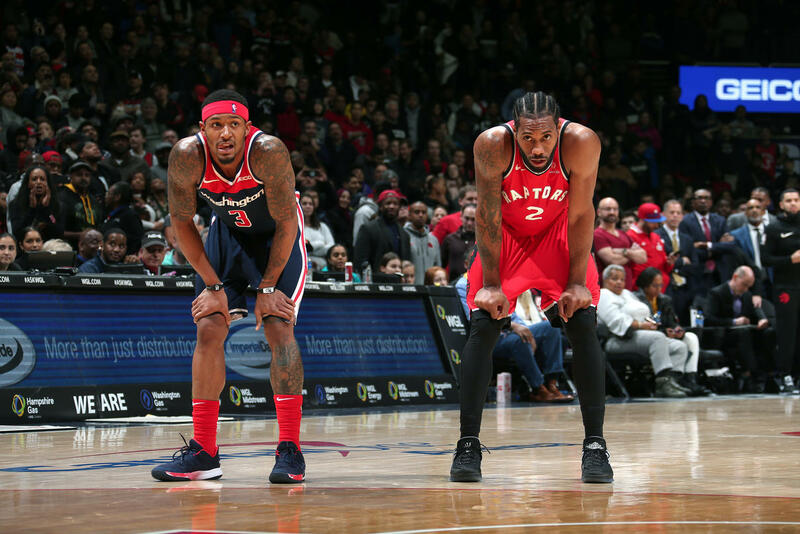 He continued his stellar two-way play by not only scoring over the slew of defenders thrown his way but also by defending the best wing players of the Wizards. Leonard also had 11 rebounds, five assists, two blocks and three steals in the game. The Raptors have now won seven of their last eight games. Throughout that stretch, Leonard is averaging 0.7 points, 7.0 rebounds, 3.9 assists and 2.4 steals in that stretch while shooting 54.3 percent from the field. He’s assumed control of Toronto as the superstar they envisioned him to be. On the other side of the duel in today’s thriller was Bradley Beal. If Leonard was brought in to be a superstar right away, Beal was thrust into the situation. John Wall is out for the rest of the season due to an injury to his heel. The Wizards have been bad to mediocre to start the season and their superstar point guard’s absence was supposed to hurt them. But So far it hasn’t. That’s largely because Beal is carrying the superstar burden. In the nine games since Wall’s shut down, Beal is averaging 30.2 points, 6.4 assists, 5.4 rebounds and 2.4 steals. During that stretch they’ve won five out of their last nine games and are battling for the eighth spot in the East. Against the Raptors, Beal was in top form. He actually outproduced Leonard, scoring 43 points, grabbing 11 rebounds and dishing out 15 assists. Beal hit the game-tying three-point attempt to end the fourth quarter and scored the game-tying layup in OT. Beal looks comfortable taking the lead for Washington. He didn’t back down from one of the best teams and one of the best players in the East. Leonard looks comfortable leading a top tier team. He’s done that before and will continue to do that because that’s who he is. With less than a minute left in the game, Curry brought up the ball and stared down Dorian Finney-Smith. Curry then passed the ball to Kevin Durant in the right corner. Durant, quickly returned the ball to Curry who resumed the one-on-one game with his defender. He dribbled closer, and then took a mini-hop backwards into a three-point shot with time winding down. At that point, Curry already had 43 points and 10 treys to his name. The ball was used to going into the hoop when he launched it so that’s exactly what happened. Curry’s three-pointer broke a 114 tie, giving the Warriors a three-point lead. On the other end, Golden State got the stop and Curry iced the game with two free throws. He finished with 48 points, 11 threes and five assists. When Curry is on fire like he was today, everyone on the team knows to give him the ball in the end game. Even a two-time MVP and killer like Durant knows. All the MVP chatter has been centered around James Harden and Giannis Antetokounmpo. The two definitely deserve all the praises for how well they’ve been playing and carrying their teams. But a name that needs more MVP recognition is Nikola Jokic. The Nuggets are the best team in the West and have dispatched all comers to the throne by consistently winning. They’ve won eight of their last 10 games and have weathered several injuries to key players. That’s because Jokic has been awesome. He’s averaging 27.3 points on 54% shooting to go with 12.1 rebounds and 7.9 assists in 2019. Against the Blazers, he put up 40-10-8 to lead the team to a bounce back win. The world needs to give the Joker much more MVP love.